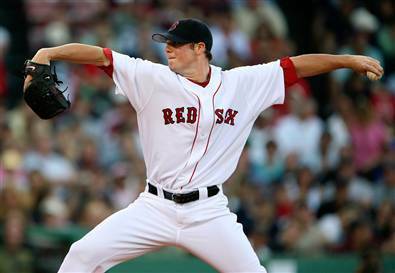 I know Jon Lester is a lefty, but tonight he reminded me of Roger Clemens during his Red Sox days. From his poise on the mound to his velocity (regularly hitting 96mph) to his mastery of the hitters, I felt like I was looking at the Sox’s next dominator. I love Jason Bay (how can you not love him?) and his homer tonight was a shocker because Lackey was methodically ripping through the Sox lineup. I’m glad everyone’s happier with the team’s chemistry and that Tito’s blood pressure has been eased by the trade. But tonight, Manny’s absence in the lineup was extremely noticable. That doesn’t mean I don’t appreciate Jason Bay. I want both of them. Ellsbury’s speed was huge tonight: two stolen bases, an infield hit, taking third on the ground out to the pitcher, the great catch in the 8th. This is the guy who will haunt Mike Scoscia’s nightmares over the next several days. He’s got game-changing speed. 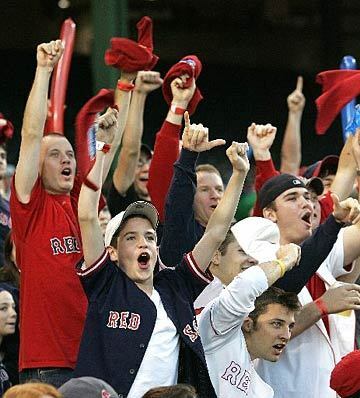 This makes TEN consecutive postseason victories for the Red Sox over the Angels. The chances of this kind of a streak, given that the teams are basically equal, is one in 1,024. (That’s the probability of flipping a coin ten times and getting “tails” every time.) So I guess our teams aren’t equal. And it’s the intangibles that make us better. We own them mentally. The Angels now have to win three out of four to take this series. The likelihood of THAT is remote. The Angels will have to get through Matsuzaka, Beckett, and Lester (again), as well as TWO games at Fenway (and that’s only if they’re lucky enough to win game two or three). Not going to happen. I thought about Dave Henderson about ten times tonight. I have always wanted to witness a no-hitter in person. Tonight, I finally did. Did I have a ticket to the game? No. Did I watch the whole game? No. In fact, I slept through a couple of innings. But I was at Fenway for the last two outs. Here’s how I experienced Jon Lester’s no-hitter. Wearing sweatpants and a t-shirt, I bolted for the car and began my speedy 12-mile sprint down Route 9 to Fenway Park. Listening to the game on the radio, I was distressed when the Sox went down quickly in the bottom of the seventh. “Come on guys! !” I yelled, imploring our hitters to give me some time to get to the park. The top of the eighth flew by too as the Royals went 1-2-3, and it was at that point that I arrived at the section of Route 9 where there is ALWAYS a speed trap. Reluctantly, I slowed down to the speed limit (prudent — the car behind me got pulled over). As the Red Sox batted in the bottom of the eighth, I hit another sand trap: construction that narrowed the road to one lane of slow-moving traffic. “NOOO!” I screamed. But I hit mostly green lights, and as Lester took the mound for the top of the ninth, I turned onto Boylston Street and searched frantically for a parking spot. Lester threw ball four to the leadoff hitter, Esteban German, at the same moment that I found an empty parking space at the McDonald’s opposite Yawkey Way. A sprint across the street and down Yawkey Way to Gate B, a flash of my Red Sox Nation VP credential to the security dude, and I was in the bowels of the park. Continuing to run at full speed, I headed for the ramp on the first base side and emerged into Fenway at the same moment that David DeJesus grounded out to Kevin Youkilis for out number two. “Wooooo hooooo! !” I had just arrived, but I was immediately in synch with the rest of the crowd that had been there for three hours. As I walked along the main aisle towards right field, fans jumped up and down, screamed, prayed, clapped, smiles on all their faces. Several people reached out to me with high-fives as I walked by. What a feeling. THIS IS FENWAY PARK, I was thinking. I found an empty box seat just beyond first base and planted myself there to watch the last few pitches. “This is it, I’m finally going to see a no-hitter!” Strike three to Alberto Callaspo! Then, bedlam. Absolute bedlam. The crowd noise completely drowned out “Dirty Water” as it blared through Fenway. I was there. After all these years, I can say I was there.